In cut and general form, military uniforms reflect the style of civilian fashion of their time, although distinctive elements, such as epaulets and headgear, are added that clearly mark the wearer as a soldier. After body armor largely fell into disuse in the mid-seventeenth century, the soldier dressed like his civilian cousin, although the colors of his clothing would reflect his unit and increasingly the state or monarch he served. The necessity to carry arms with belts capable of holding ammunition pouches, bayonets, swords and the like did give the soldier a distinctive appearance. Even at this early point in the evolution of military uniforms a purely military form of headdress, the grenadier cap, came into being. During the late seventeenth century, the grenade was a significant factor in infantry tactics. It was an iron sphere filled with gunpowder that was ignited by a fuse. Specialist troops were trained to light these fuses from a hand-held match and then throw the grenades into the ranks of the enemy. Since two hands were required for this, grenadiers had to sling their muskets on their backs, an operation difficult to accomplish when wearing the broad-brimmed hats of the era. Thus grenadiers were given a sort of stocking cap. Some military tailor concluded that these grenadiers, already selected for their size and strength, would look even more impressive if the cap were stiffened to increase the apparent height of its wearer (Laver's seduction principle). The grenadier cap became a symbol of an elite soldier (Laver's hierarchical principle). Since elite troops were useful for assaulting or defending key positions on a battlefield, European armies continued to designate units as "grenadiers," and these wore grenadier caps long after grenades had become obsolete (hand grenades were reintroduced in warfare in the trenches of World War I). The grenadier cap was sometimes given a metal front (such as that worn by the Russian Life Guard Pavlovski Regiment in full dress until 1914) or made of fur. The fur headdress worn by the Brigade of Guards at Buckingham Palace in London is in fact a grenadier cap. The horsed soldier was sometimes distinguished from mounted civilians by wearing the cuirass. This body armor continued to be utilized by heavy cavalry long after the infantry had abandoned it. The civilian hat was worn for a long period, despite its proclivity to be blown from the head when engaged in a charge. 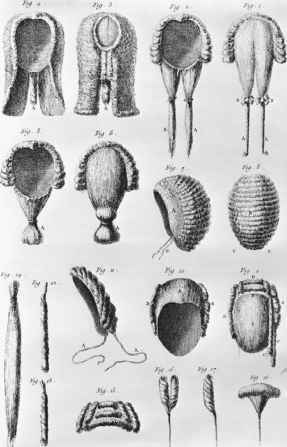 This tendency eventually led to the cocked hat being replaced by helmets of various forms in the late eighteenth century. The crest on these helmets served both the seduction principle and the utility principle, for in addition to making the horseman more imposing, it provided some additional protection from sword cuts. It was the recruiting of light cavalry from the eastern frontiers of Europe that provided a novel and exotic appearance for a large portion of the cavalry in eighteenth- and nineteenth-century European armies. Austria first recruited Hungarian horsemen to serve as light horse in its military establishment. The dress of these Hungarian hussars had a great influence on military style, both for mounted troops and soldiers. Many armies copied the appearance of the Hungarian jacket fastened by many rows of cords and toggles across the chest. A second, fur-lined jacket (the pelisse) slung over the left shoulder was also widely adopted in the dress of light cavalry, as was the sabretache, a leather pouch or envelope that was suspended from the sword belt. It is Hungarian headgear that probably had the greatest impact on the appearance of the military. These horsemen wore either a stocking cap edged in fur or a cylindrical felt cap. Through time the fur on the stocking cap was expanded, making the fur cylinder with a bag falling to one side from the top, a form of headdress known as the busby. The cylindrical felt cap was the inspiration for the shako. The shako was widely adopted in all branches of the military during the Napoleonic Wars. Britain dressed its infantry in shakos in 1800; it was not until 1806 that the line infantry of Napoleonic France adopted this headdress. 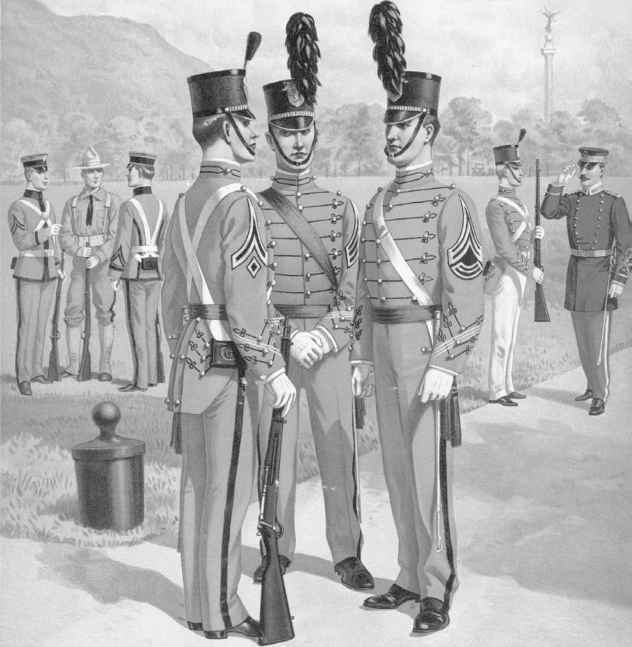 The shako continued as the most common form of military headgear until the defeat of France by Prussia in 1870 and continues to be worn by some units (as, for example, in the full dress of the Corps of Cadets of the U.S. Military Academy). Just as Hungary provided the pattern for the dress of hussars in armies around the globe, Poland provided the model for the dress of lancers, particularly after Poles played a prominent role in the multiethnic armies of Napoleon. The square-topped czapka and plastronfronted jacket or tunic with piping along its seams was worn by substantial segments of cavalry in Europe and even had an impact on the uniforms of colonial India. Early twentieth century West Point military academy cadets. The shako, a hat worn by the cadets shown here, held the allure of adding apparent height to the wearer. Anne S.K. Brown Military Collection, Brown University Library. Reproduced by permission. bonnets would be protected from the weather by oilskin covers. Loose trousers replaced the tight breeches and long buttoned spatterdashes or gaiters of the parade ground. With the coming of the long period of peace following Napoleon's defeat, the appearance on the parade ground moved to the forefront and uniforms reached a degree of fantastic elaboration not seen before or since. The realities of war returned in the late nineteenth and early twentieth centuries to banish such sartorial splendor from military life. Reflecting changes in civilian fashion, by the mid-nineteenth century the tight-fitting waist-length coatee, widely worn for nearly fifty years, was replaced in the world's military by the tunic or frock coat with skirts that at least partially covered the thigh. Russia and Prussia also adopted leather helmets with brass spikes, while for the most part the rest of the world continued to wear the shako or kepi. 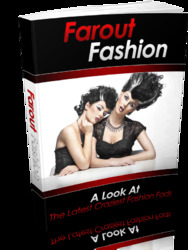 At this same time there were developments in firearms technology that led to a revolution in military uniforms. For almost three centuries the smooth-bore musket had dominated the battlefield. The effective range of this weapon was so short (one hundred yards or less) that troops were drilled not to fire until they could see the whites of the eyes of their enemy. Hence, the color of a uniform was unimportant as long as one could be recognized by one's allies and not be taken for the enemy. While there was some use in battle of firearms with rifled barrels that were effective at far greater distances, these early rifles were cumbersome to load. The invention shortly before the American Civil War of a rifle, which could be loaded as rapidly as the old smooth-bore musket, was soon followed by the invention of a breech-loading rifle. A further innovation was the magazine rifle allowing an infantryman to fire several shots after a single act of loading his weapon. Smokeless powder eliminated the huge clouds of acrid smoke that obscured vision on the black-powder battlefield. All of these factors led to the adoption of uniforms whose purpose was to inhibit the recognition of troops at the great distances at which they were now vulnerable to rifle fire. Khaki was first used in India, originally in the Corps of Guides raised by Lieutenant Harry B. Lumsden in 1846. A decade later, during the Indian Mutiny, a number of British regiments dyed their white summer uniforms khaki to be less visible on the battlefield. While Britain experimented with other drab colors, notably gray, khaki was worn in India, becoming official dress for that station in 1885 and for all foreign stations in 1896. In 1902 Britain adopted a khaki service dress. Other nations followed Britain's example; the first three to adopt a khaki service dress were the United States, Japan, and Imperial Russia. Both France and Germany used khaki for their colonial troops, but Germany in 1910 chose a light gray for its regular army and France, while it began the Great War still in dark blue uniforms, switched to horizon blue early in 1915. The trench warfare of 1914 to 1918 led to the universal adoption of steel helmets. The threat of gas attacks meant gas masks had to be easily accessible. Trenches, barbed wire, and the machine gun reduced the cavalry to no role at all. Increasing mechanization meant the auto mechanic replaced the farrier in keeping the supply lines functioning, and at least one critic of modern trends in uniforms has lamented that the dress of the soldier now mimics that of an employee of a service station. The war changed the view of the proper soldiers from that of impressively and colorfully dressed units executing precision drill on the parade ground to massive armies engaged in savage warfare under the appalling conditions of the modern battlefield. The pomp and splendor of military pageantry and glory of full dress observable before the war (as late as 1913 the German army was executing maneuvers in a version of full dress) was gone forever. Wars subsequent to the watershed years of 1914 to 1918 have seen the combat uniform increasingly, and with greater sophistication, being designed to prevent the soldier from being seen rather than allowing an imposing appearance to frighten or cow the enemy. Khaki and olive drab have been replaced by "disruptive pattern" clothing to conceal even more effectively the fighting man or woman. Uniforms have come to be designed even to conceal the soldier from the night-vision equipment finding increasing use on battlefields. The small flashes of color, the division patches that identified the soldier's unit in World War II, have been reduced in the American army to black on olive drab. The increased emphasis on concealment has exacted a price, however, as "friendly fire" has at times proved as hazardous to troops engaged in military operations as the fire from a dispirited enemy overwhelmed by a long period of bombardment from aircraft and missiles. There has also been an emphasis on attempting to protect the soldier in combat. Modern technology has produced lightweight body armor, "flak jackets," to protect the torso. Some nations have suits, yet untried in a combat situation, to enable the soldier to fight on a battlefield contaminated by nuclear or biochemical weapons.